Welcome to the website for my animal rights music, including my album, Songs for Animals, People and the Earth and a new single, Just Like Us. 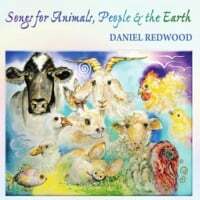 Through these songs, I want to share with you my experience of the profound beauty, sensitivity, and intelligence of animals, especially the farm animals that people use for food and clothing. I’ve created this music because I want to do everything I can to make this world a kinder, more compassionate home for animals and to support the movement for animal rights. You can listen to the songs for free on this website. If you like what you hear, please share links to the songs or buy the album or individual tracks on this website. Please also check out our Facebook page, Daniel Redwood Songs, and put up a post to let me know your thoughts about the music. If something in these songs touches your heart, or makes you think, or lifts you toward positive action on behalf of animals, people and the Earth, nothing would make me happier. That’s what the songs are for. Peace and blessings to you and to all beings. © 2019 Daniel Redwood. All Rights Reserved. Powered by HostBaby.